Last night was technically the New Moon, although there was nothing to see in the sky. At the Full Moon, I pulled a card to see whose energies would be leaving me and it was, thankfully, the slightly peevish Knight of Cups. I’m very fond of the Queen of Wands, and Kat Black’s young queen from the Touchstone Tarot is an absolute corker! Kat’s deck is a painstaking collage of artworks sourced from 16th and 17th century Europe and this particular Queen of Wands has the body of a young Princess Elizabeth I and that gloriously knowing face belongs Marchesa Brigida Spinola-Doria. To me, the expression reminds me – a little – of our current Queen Elizabeth (Happy Diamond Jubilee if you are reading this, Your Maj) as a young woman – although she was not quite so……bold. The black cat of intuition and feline wiles sits patiently in her lap as the Queen of Wands gazes out at you with a come-hither expression. 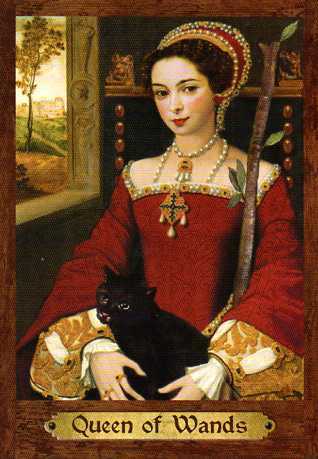 The Queen of Wands is associated with all those active, can-do attributes of the realm of Wands. As seen in the Minchiate post – this is not always positive and she can be a bit of a stirrer with that big stick of hers….clearly I’ll be trying to avoid THAT particular attribute! However, on the whole, this is a woman who sees obstacles as opportunities and is confident in her own skills and skin. This is a woman who whistles before breakfast. Well, I could certainly do with a quick shot of the Queen of Wands through my sinews I can assure you! I was supposed to go for a run today, but I took one look out at the wet, miserable morning and opted to write a blog post instead. Clearly her energies are going to be sloooooow to materialise over the next couple of weeks! What do you think of Kat Black’s Queen of Wands? What might she bring to your life? BTW – there is a copy of this deck for sale on amazon for over £400! WTF?! as the Queen of Wands might say! What! £400! And to think I trimmed mine. Doh! Not that I've ever part with it. Don't know whether the one on Amazon is actually a limited edition one….and it's a lovely deck, but WHO would pay that?! This is a deck that somehow never appealed to me, go figure! However, I do like this Queen of Wands. Her expression is very picaresque, a female rogue and adventurer, certainly sly. She also reminds me of Morena Baccarin (http://www.imdb.com/name/nm1072555/). So, bringing a bit of adventure and a willingness to thumb your nose at convention? Yes – that's a perfect way to describe this Queen of Wands especially! But I love my Touchstone. Won't do it. Can't make me. Even with our discussion about MT and AW. So there. If you sell it, Arwen, you'll be able to afford that ipad nooooo bother! :looks darkly at Alison and nods at Vivianne: Whistling women and crowing hens || All come to no good end. Kat's deck is so beautifully put together, you forget that it's a collage 😉 I haz a tuneless whistle, but I whistle anyway.